This superb complex comprising 25 individual buildings is in fact two separate hotels the Melia Villaitana and The Level at Melia Villaitana Hotel. Located in the hills high above the resort of Benidorm. 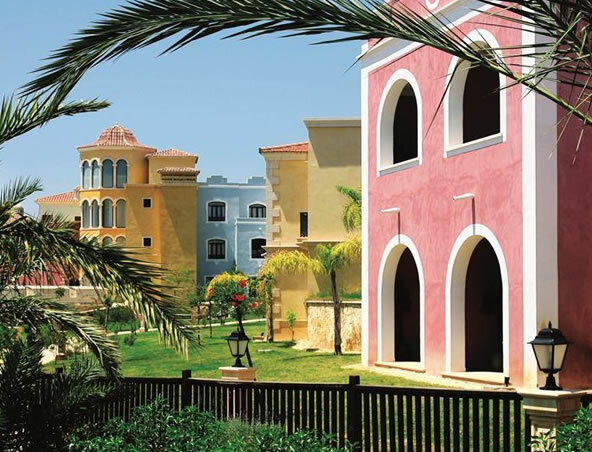 Designed as a Mediterranean village this superb retreat will suit a wide range of guests. 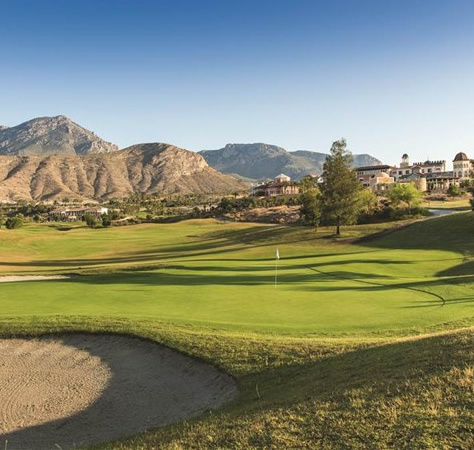 Golfers will appreciate the adjacent two Jack Nicklaus designed golf courses, older families and couples will appreciate the facilities and quality rooms. The hotel is a great venue for meetings and conferences and is renowned for wedding ceremonies that are a specialty here too! Benidorm is just 4 km from the complex. Alicante Airport is 50 km away. Nearby are the Terra Mítica Theme Park and Terra Natura Nature Reserve. Melia Villaitana provides its guests with a wide choice of rooms - 356 rooms (103 Deluxe Rooms, 104 Melia Rooms, 24 Premium Rooms, 79 Junior Suites and 46 Family Suites). 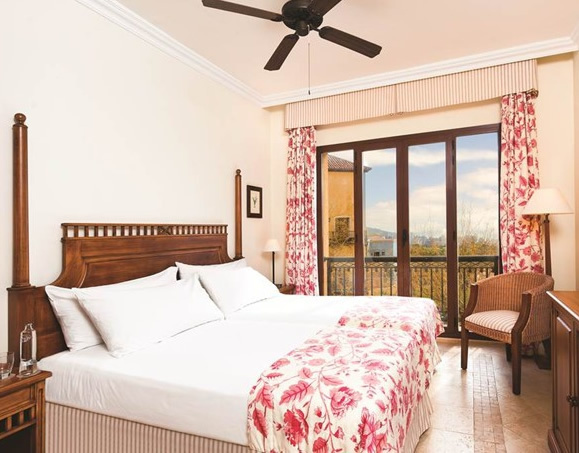 All the rooms have an elegant Mediterranean decor and design with rich tones of white, beige, gold and red, with superb views of the golf course, sea, garden or pools. Fitted with either a king size bed or two single beds, 42 inch LCD TV, air conditioning / heating, functional work desk with Wi-Fi internet, minibar, safe, terrace and a fully equipped bathroom. Melia Villaitana offers guests a carefully chosen yet wide selection of dining options based on the freshest local ingredients. 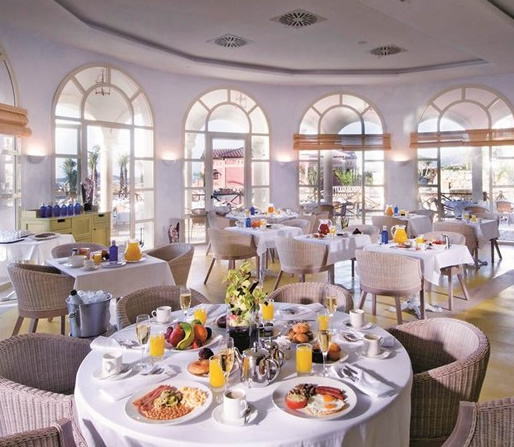 Here you can enjoy exquisite cuisine without leaving the hotel, Mediterranean cuisine is a specialty which combines local recipes with creative cooking techniques in an attractive and welcoming ambiance. There are 6 different restaurants that provide a varied cuisine from Tapas and Barbeque to Asian and a la carte. (services depend on season and opening times are subject to change). After a day of golf or relaxation why not visit one of the selection of on site bars, our favourite is the Papa Mambo Jazz Bar, ideal for a cocktail or too! 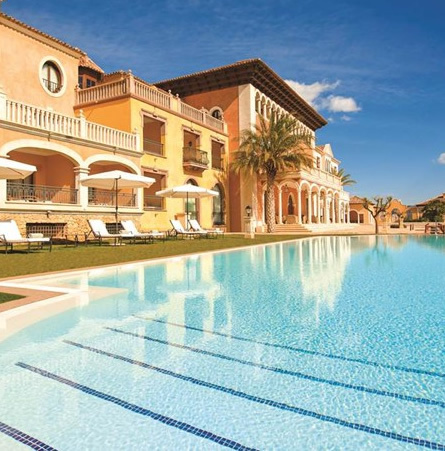 The Melia Villaitana provides two 18-hole golf courses, 5,000 square metres of swimming pools, two tennis courts and six paddle tennis courts, children’s park, kids club and an artificial beach, The Wellness Centre has a fully equipped gym and spa with a myriad of beauty treatments. At Melia Villaitana the fun lasts day and night. There is a varied and extensive entertainment programme during the day with different sports and leisure activities available for both adults and children. In the evenings you can enjoy the hotels nightlife with parties, shows, performances and live music (programme available in high season and subject to possible changes). The Hotel provides a wide range of facilities to provide you with everything you need for your holiday, wedding or business break: a 24 hour reception is available, Free WiFi is available throughout the hotel. The reception area offers a fireplace, free newspapers and a safety deposit box at the front desk. Other facilities include dry cleaning and laundry services and concierge services.